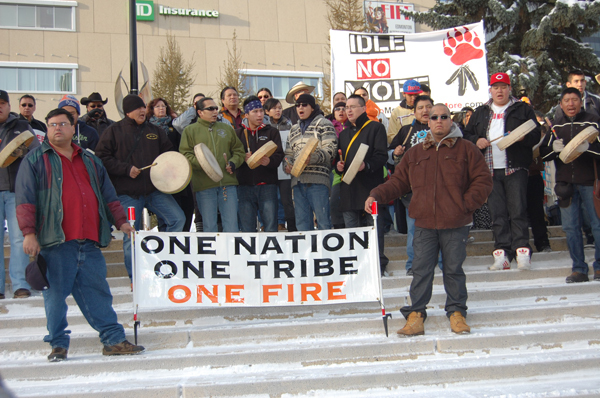 First Nations in the country have reached the end of their patience. That was noticeably evident during what’s being called the ‘Scuffle on the Hill’ on Dec. 4, 2012. Chiefs were in a special assembly hosted by the Assembly of First Nations in Gatineau. They were expressing their frustration on the legislation contained in the Conservative government’s Omnibus Bill or Bill C-45. First Nation leadership marched to Parliament Hill where they gave speeches,and since the bill was being debated inside the building, they decided to go in there so Canadian politicians could hear their concerns in person. They were worried about the many impacts contained in the legislation, including changes to the Indian Act, land claims and the Navigable Waters Act. Anishinabek Nation Grand Council Chief Patrick Madahbee looked as though he was trying to push past security to get into the House. In a telephone interview, he said, “We thought the Minister of Indian Affairs was going to come out, but he didn’t come out. The Minister of Natural Resources [Joe Oliver]came out and his remarks were the same old, same old sentiments that, you know, they’re doing everything for First Nations, respecting the environment, they’re going to create jobs for First Nations,” Madahbee told Windspeaker. Madahbee didn’t agree with the legislation and said the government was going against the commitment from the Prime Minister made at the Crown/First Nations Gathering at the beginning of 2012. Madahbee suggests the omnibus bill has done the opposite. In the background of the Hill Scuffle, a head taller than the other chiefs, Lake Huron Regional Chief Isadore Day could be spotted holding the replica of the 1764 Treaty of Niagara Covenant Chain wampum belt. “It was very interesting that Minister Oliver would come out and say they want to work with us, they want to do things right, all the while, going back into the House to debate the bill,” said Day. Both Ontario chiefs give credit to Onion Lake First Nation Chief Wallace Fox. It was his request that led them on a march to the Hill. But even Fox doesn’t take all the credit. Meanwhile, in the House of Commons, politicians continued their debate on Bill C-45. Opposition party members were requesting clauses from different sections be deleted or amended. Green Party Leader Elizabeth May asked for several amendments with respect to First Nations, including land claims within the Northern Growth and Jobs Act as well as the Navigable Waters Act. The issues with government reach beyond the borders of Canada. Like Grand Council Chief Madahbee, Chief Fox indicated government tactics know no bounds. He referenced the Canada-China trade agreement. “What right does Stephen Harper have to go overseas to enter a treaty with another country when they didn’t even get permission from us? This is our land and this is our resource,” said Fox. Chief Day agreed with both. The movement has already begun by the grassroots people. 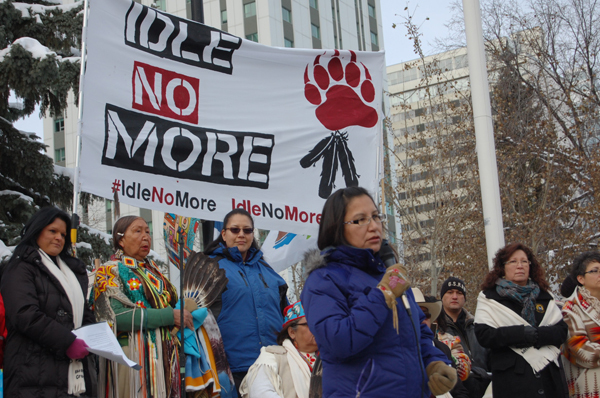 The ‘Idle No More’ campaign was launched shortly after the demonstration on the Hill. There have been demonstrations throughout the land in the form of sit-ins, rallies and marches in various places across the country during December. Prime Minister Stephen Harper’s omnibus bill was given royal assent on Dec. 15. There are plans, however, underway for more rallies and demonstrations across the land. And chiefs agree, it’s time to get more aggressive to be heard.